Five solar debates: will a-Si and Concentrating PV survive? I’m a big fan of the efficient frontier framework in solar: in general, you can get better performance, but you have to pay more. And while everyone wants to break away from the pack, most people who claim to be way off from the efficient frontier are lying to themselves. 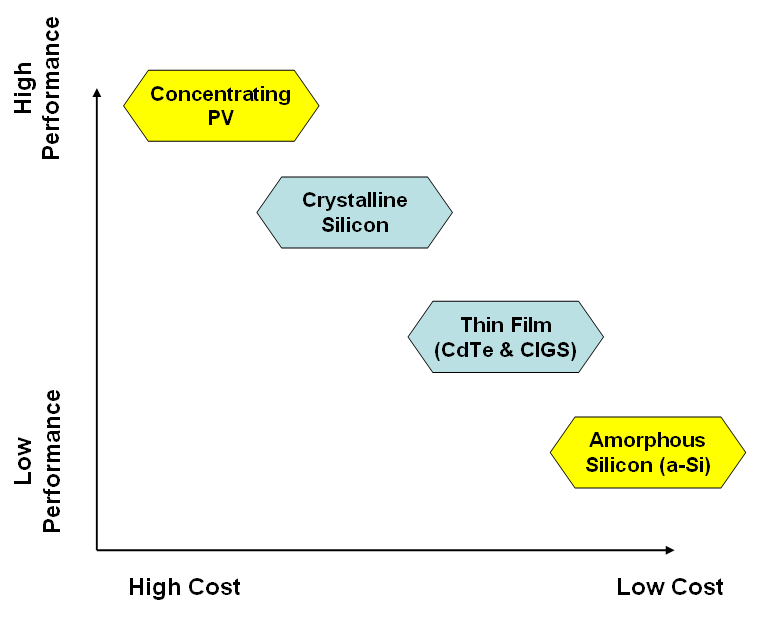 There are two technologies that have taken new approaches to the efficient frontier: amorphous silicon (low cost, low efficiency), and concentrating PV (high efficiency, but higher system cost). Neither approach is guaranteed to pay off. I’ll break down the outlook on both. The amorphous silicon market is dominated by two tool major manufacturers, Applied Materials and Oerlikon. They have, collectively, nearly a dozen clients, including ENN, Signet Solar, Sunfilm and Moser Baer. There are also a number of large companies with amorphous products as part of their portfolio, such as Sharp, DuPont, and Q-Cells/Sontor. Sharp’s business seems to be thriving. Even Qualcomm is getting into the mix. Seems like a nice list of blue-chip clientele. However, the technology already has a few black eyes. Sunfilm filed for bankruptcy, and eventually merged with Sontor. Applied Materials is rumored to be scaling back their business, and considering abandoning it. This is led some people to question whether this technology will even become obsolete. Part of the problem is that amorphous’ low efficiency forces them to pay a penalty, as I explain here. Concentrating PV is also controversial. They start with high-efficiency semiconductors (efficiency of nearly 40%) which are very expensive. Since the material is expensive, they shrink it reduce the cost, and use lenses to concentrate the light that it sees. Most concentration factors range from 10x to 500x – meaning that you use 10x to 500x less material, and that material would see 10 to 500 times the regular intensity of the sun. However, the decision to use concentrators creates other system requirements. The optical systems require the lens to be pointed at the sun (in other words, dual-axis trackers are required). These are expensive. Also, that much concentration generates a ton of heat – so these systems typically incorporate a cooling system. Again, more cost. The sector has a number of well-funded, talented startups, including SolFocus, GreenVolts, Solar Junction, Solaria and Soliant. Amonix just closed a 126MM round from Kleiner Perkins and Goldman Sachs – smart money, a very good sign for the sector. On the other hand, the market has over-promised and under-delivered for years. There are still big detractors, and I’ve heard someone within the industry say that if they don’t put up big numbers in 2010, they never will. Finally, there are a lot of questions about the long-term maintenance requirements of the systems, and these questions won’t be answered conclusively for years. I think both of these technologies have legs, particularly in specific applications. 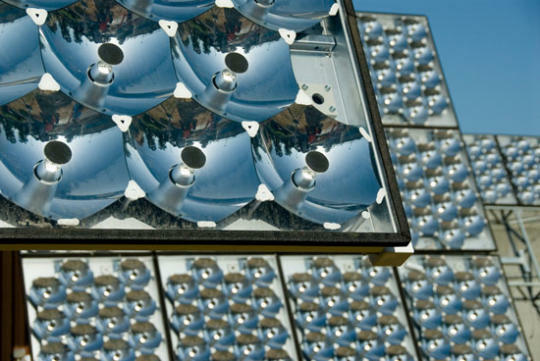 Amorphous can thrive in large applications where the economics are in their favor, while concentrators are great in areas with a lot of direct sun. But the jury is out on whether these will remain niche technologies or serious players.